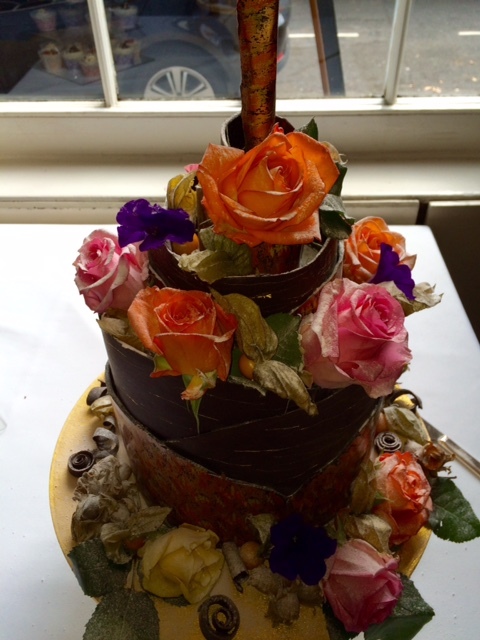 I often hear brides say they want a wedding cake but they’d really like it to be chocolate. If that’s you, then let me introduce you to Chocolate Delores. Chocolate Delores designs and creates sumptuous, handmade chocolate cakes for any occasion, especially weddings, and uses only the best organic, fair trade ingredients! The brains behind this wonderful brand is Lizzie Melling, who started baking cakes at the tender age of 10 and went on to work for one of Britain’s leading organic cake makers for 12 years. During that time Lizzie trained in couverture and learnt the art of the chocolatier. Lizzie is a true artist and her cakes reflect this. Each is individually made and a perfect work of art. Her work really is true craftsmanship and will be a talking point of your day. Every time I see her work I discover a new favourite from white chocolate cherubs to seashells and incredible chocolate spires, her imagination knows no bounds and her ability to turn it into a chocolate reality is awesome! But don’t worry – they don’t just look good – as a big fan of Chocolate Delores’ cakes I can assure you they taste divine. One piece is never enough! The main ingredient is a deliciously dark chocolate and each cake is soaked overnight in Port before being layered with Madagascan vanilla buttercream and homemade plum jam. After that, using white, dark or milk chocolate, master chocolatier Lizzie gets to work designing. Even as I write this, my mouth is watering as I know just how truly delicious Lizzie’s cakes are. So if you want a stunning fantasy cake as a centrepiece for your day AND your guests to be blown away by how delicious it is, you need to come and meet Lizzie. You won’t be disappointed!